the Republican National Committee, 1930-32. Defeated for reelection in 1934, he died in 1936. FDR this day signed the Beer and Wine Revenue Act, which made sales of beer and wine legal under federal law, but imposed a tax on such sales. This was an important shift, from prohibition of alcohol to taxation of it. The tax was called America's first "sin tax" but tax policy experts today refer to a tax on luxury goods that many disapprove of as "Pigou" taxes. Named after Cambridge University economist Arthur Cecil Pigou (1877-1959), a Pigou tax is intended to reduce the amount people consume of the good. At the same time, if the tax is enforced, it raises revenue for government programs. This was a win-win for FDR. 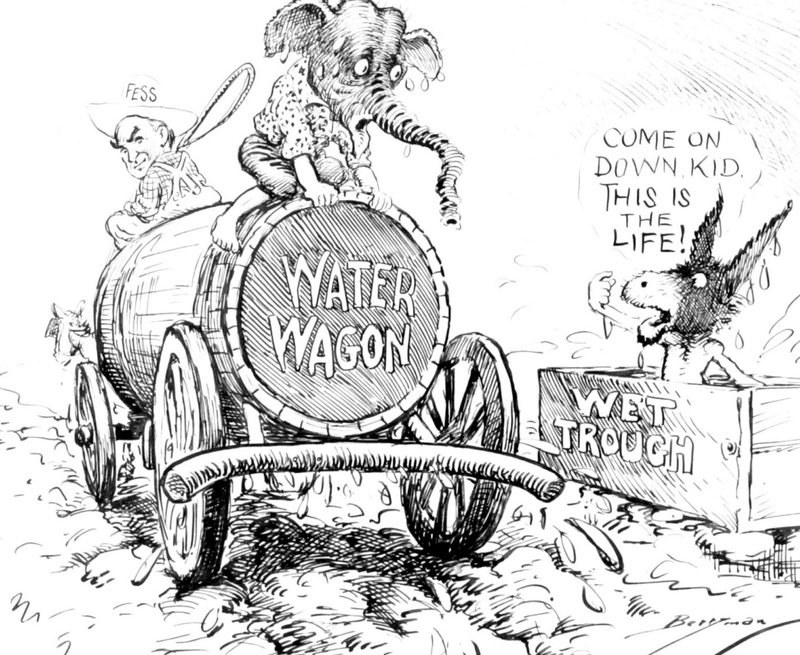 He raised money for his New Deal programs to generate jobs at a time when the unemployment rate was 25 percent, at the same time as he could tell temperance supporters that he was discouraging beer and wine sales by making them more expensive. For beer fans he was a hero because he made beer and wine legal (up to 3.2 percent alcohol), undercutting the illegal establishments that sprang up under Prohibition (as many as 100,000 "speak-easies" operated in New York City alone). Collecting taxes on alcohol was much less costly than trying to track down illegal sales during the Prohibition era, so FDR saved his Treasury Secretary, Will Woodin, some money in this area. Temperance advocates had long sought prohibition of sale of alcohol and they succeeded in 1919 with passage of the 18th Amendment and its accompanying Volstead Act. One argument against women getting the vote had been that more women would mean more votes for Prohibition. One reason that the 19th Amendment, recognizing women's right to vote throughout the United States, was passed in 1920 was that the fear of Prohibition became a reality without universal woman's suffrage. Prohibition forbade manufacture, sale or transporting of liquor, i.e., any beverage with more than 0.5 percent alcohol by volume. Prohibition was found not to cut down on consumption while depriving government of tax revenue and imposing heavy enforcement costs. Prohibition was repealed in December 1933 by passage of the 21st Amendment. On this day in 1933, eight days after his inauguration, President Franklin D. Roosevelt gave his first national radio address or “fireside chat,” broadcast directly from the White House. He had told his lifelong-GOP Secretary of the Treasury, Will Woodin, that he didn't want to be bothered with the details of the solution to the bank panic because he was going to concentrate on communicating the resolution to the public. This was a disappointment to Columbia Prof. Raymond Moley, who was serving as FDR's adviser on the banking crisis and wanted to consult with FDR at every point, but Woodin went right to work. The Friday before FDR's inauguration, most banks had already been closed because so many states had initiated their own bank holidays, to give the banks some breathing room as depositors were lining up to withdraw all their money (outgoing President Hoover wouldn't act without FDR's agreement, and FDR's position was that he was not going to become President until March 4). The scene of panic throughout the banking system was shown vividly in Frank Capra's movie It's a Wonderful Life (1947), starring Jimmy Stewart as small-town banker George Bailey, who is considering suicide as he sees his depositors destroying his bank, one depositor at a time. Print $2 billion more greenbacks for the banks to have on hand. Publicize the printing and packing of the greenbacks with filmed news clips for the cinemas. Examine the banks one by one for solvency, on a priority basis. Take steps to close and liquidate the unsound banks. Prepare new legislation to prevent a recurrence of the banking crisis–the legislation being passed within months as the Banking Act of 1933, aka the Glass-Steagall Act, named for the bank-regulatory provisions proposed by Senate Banking Chair Carter Glass (D-Va.) and the deposit-insurance plan proposed by House Banking Chair Henry B. Steagall (D-Ala.). Prepare new legislation to provide oversight over non-bank financial institutions, which became the Securities Exchange Act of 1933. Meanwhile, FDR laid the public-communications groundwork for all these steps. In his Fireside Chat he explained the closure of the banks as necessary to stop a surge in withdrawals by panicked depositors. 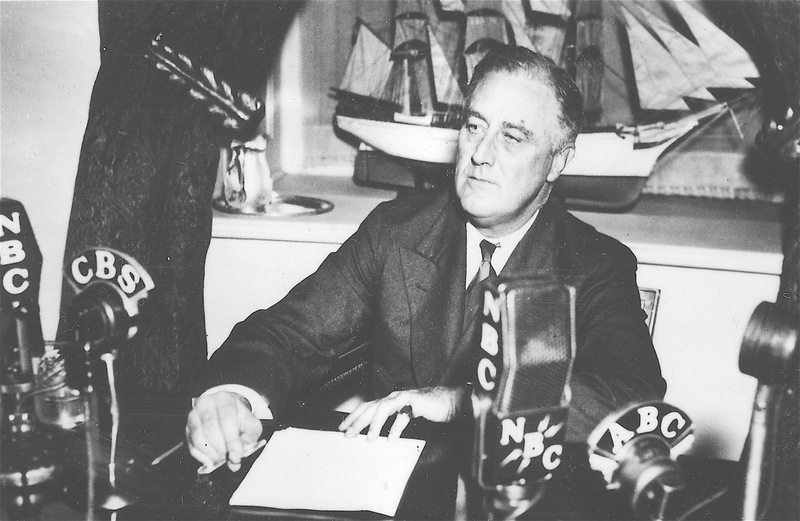 Many banks would be reopening the next day, FDR said, and he thanked Americans for their “fortitude and good temper” during the period of the bank holidays. When FDR took office, the United States was suffering the highest rate of unemployment, with between one-fourth and one-third of workers being unemployed. The Fireside Chat got its name from radio journalist Robert (Bob) Trout, who was called "the Iron Man of Radio" for his ability to keep talking during a breaking news story. FDR's purpose was to inspire confidence in himself and in the nonfunctioning banking system. While the chats sound folksy, FDR took great pains to make them that way, using simple vocabulary and anecdotes. Presidents had previously communicated with their citizens almost exclusively through journalists. The Fireside Chats were without precedent and they were effective because radios were still magical and were owned by 90 percent of U.S. households. 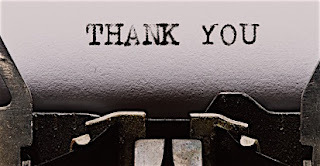 My G+1 Google counter shows page views for my blogs passed one million on March 9. MONEY | County Wealth – Indian River, Fla.
Indian River County, Fla. Economic Summit Meeting, March 2016. That is your blogger in the red shirt. 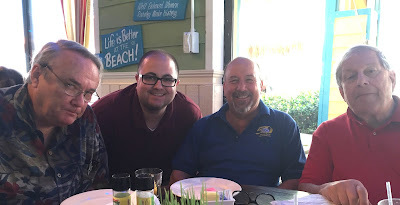 The Indian River Economic Summit met last week at a restaurant overlooking the Atlantic Ocean in Vero Beach. We discussed the Indian River and County and Vero Beach economies. 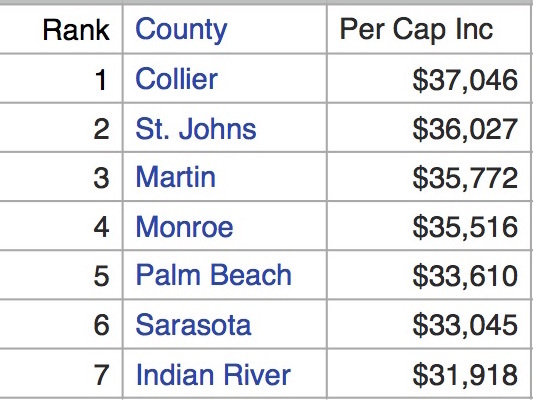 Indian River County ranks #7 in Florida on per capita income. See chart at right. Narrowing down to zip codes, Indian River County includes one of the wealthiest zip codes in the United States (32963, the Barrier Island of Vero Beach, traversed from top to bottom by State Road A1A). IRS data on Adjusted Gross Income and Income per Return are available for 199 Florida zip codes. But some of the zip codes cover are enclaves–with a small number of individuals and don't constitute real communities. Now we delete the odd zip codes with fewer than 100 tax returns and focus on the top 10. Look at the four zip codes that have 1,000 or more tax returns filed. These four zip codes stand out as viable communities with high incomes–Palm Beach 33480, Longboat Key 34228, Vero Beach 32963 and Naples 34102. 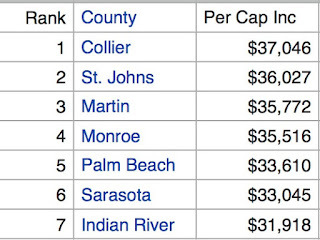 Vero Beach ranks #3. The smallest is Longboat Key and the largest is Vero Beach. All four communities have cultural facilities that punch way above their weight for communities of their size. How does this play out in Vero Beach? A new two-story Main Library opened in 1991 and a bequest to the library by the Julian W. Lowenstein family in 1985 has been used to help construct a new library building with a much-expanded 2nd floor. It now houses The Florida History and Genealogy Department, reference department and reading room, bearing the name of Mr. Lowenstein. The library owns a microfilm copy of the entire U.S. census from 1790 to 1860. The county commissioners approved funds to expand the children's, reference and genealogy departments. Between 1991 and 2002, the genealogy department quadrupled in size to 4,000 square feet. It includes the Indian River County Historical Society photographs (5000+) and documents (20+ boxes) to the library's "Archive Center", which now has more than 35,000 titles, 40,000 microfiches, 11,000 microfilms, 9 computers and Wi-Fi. At the end of the last century the library was first or second in Florida in per capita attendance at adult programs and new borrowers. This may account for the three negative reviews on Yelp of the library's services in 2013 and 2015 in comparison with, for example, the County Library branch at Sebastian. But one goes to a library primarily to look for books and other documents, and secondarily for the services of the staff, so it might be a good trade to go to the busier library even though the staff may be busier and less generous with their time than in a library with fewer books and patrons. St. Edward's School – and the Classical Orchestra that performs there – is another gem in Vero Beach. The Vero Art Museum and the Riverside Theater are two more institutions that are astonishingly vigorous for such a small community. The Indian River Medical Center his attracting talented doctors in a variety of fields. The Vero Beach Regional Airport is a joy to use as an alternative to Orlando, West Palm Beach or Melbourne. New attractions are picking up support like the Indian River Historical Society. Indian River State College is a community college with some B.A. degree offerings in public service and agricultural fields for which demand for skilled help n the region is high. For advanced degrees students attend institutions in neighboring cities with academic faculties offering master's and doctoral programs. The Economic Summit meeting concluded with a general sense of optimism about the county's economy, with a diverse base of supporting institutions and available labor for agricultural, cultural, real estate, retail, medical and sports employers. The Summit members were, however, concerned that local priorities remain focused on adequate protection of the environmental attractions that draw visitors and retirees to the area. This means controlled growth and aggressive precautions to avoid or prepare for natural and man-made disasters. The CityEconomist blog just passed 240,000 page views. Here are the Ten Most-Read Posts during the past month, and following that, the Ten Most-Read during the life of this blog.